We just received these photos from architect Robert Alan Asistent. The building is scheduled to open in March or April. After these many years of planning, it’s incredible to see the Spiritual Space taking form. Click here for architect’s plans and dimensions. 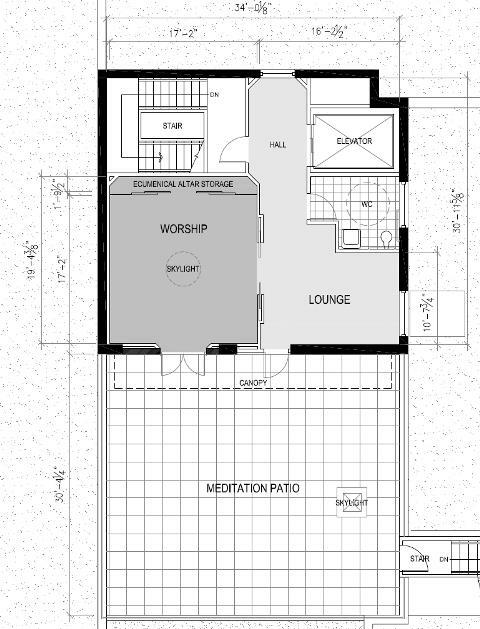 There have been a few changes decided on during construction, for example, the altar storage will be in the entry hallway rather than the Worship Space, and the doorway between the Worship Space and the Lounge is larger. North Lounge area/ Fire Escape door. As opening approaches, we have to come up with funds to furnish and finish this space, as well as cover monthly rent and expenses; we could use your help! All donations are tax deductible. South Interfaith Entry: Worship/Contemplation Space doorway into Lounge; this doorway will be able to open completely so larger groups can be accommodated. Besides religious and spiritual traditions, groups like Alcoholics Anonymous have shown an interest in using the space for meetings. East wall with steps and doorway to Meditation Deck. The reclaimed oak on the steps came from another part of this historic building and will be used to provide flooring throughout the Spiritual Space. We were wracking our brains trying to figure out how to afford a costly wood floor, so this is a great gift from the building! Meditation Deck (enclosed space within safety railing).We hope to add a partial awning or canopy, tile floor, a water feature and lots of greenery. The railing will be hidden behind live bamboo. View of Skyline from Meditation Deck. Originally we envisioned screening all sides of the deck with bamboo, but who wants to cover up that gorgeous view? We are trying to decide between the “Daredevil Orange” paint covering the wall and the “Red Radish” sample in the corner. I like the interior as they begin to unfold as construction progresses. The interiors are well planned it seems. In my own opinion the interior is awesome. But are they strong enough to withstand the hands of time? This is a nice floor plan. I think this one would can be used to help a meditation session because the floor is to big. I kinda love the place, it looks very well constructed and the layout seems professionally done. I can't wait to see the completion of this project. The new construction of this place seems to be in good pace. I'm looking forward to the meditation room. You have done really the great the great job of the construction work. If you are looking to get the proper Train the trainer ladder safety training course then, get it from Safetyfirsttraining.